Passenger door opens 28'' from the top corner of the door to the body; the Driver's side now opens 35". The door check strap measures 2'' at the first 'bump' on both doors. The door is not cosmetically damaged and I can see no bends or other damage. When closed, the door is not misaligned and is flush with the body. The problem is that when gently closing the door, it must be forced to close the remaining 3" as seen in the attached pic. I assume this is a distorted A pillar? I've heard of using a piece of wood in the hinges to bend the pillar back, but I really don't want to do more harm. I would like to hear some opinions on repair before attempting this. Thanks for any information and ideas. 1987 Blue-grey turbo 300d "The Panzer Vagon"
Last edited by Freybird; 09-26-2011 at 11:06 AM. Reason: Forgot "Thank You". I do not have any suggestions for you but I would lose sleep of doing this...in fact I may lose sleep over YOURS! I would pull check strap to make sure it is not holding door off then call an old skool bodyman if anything needs to be straightened. FWIW, my friend that used to own a bodyshop claims to have made much money repairing damage from people backing with the door open. "Open door backing" is a prohibited activity in my family punishable by tirades and verbal abuse. Vehicle damage hasn't happened yet but would have to be quickly forgiven else the country song "sleeping single in a double bed" would be invoked. 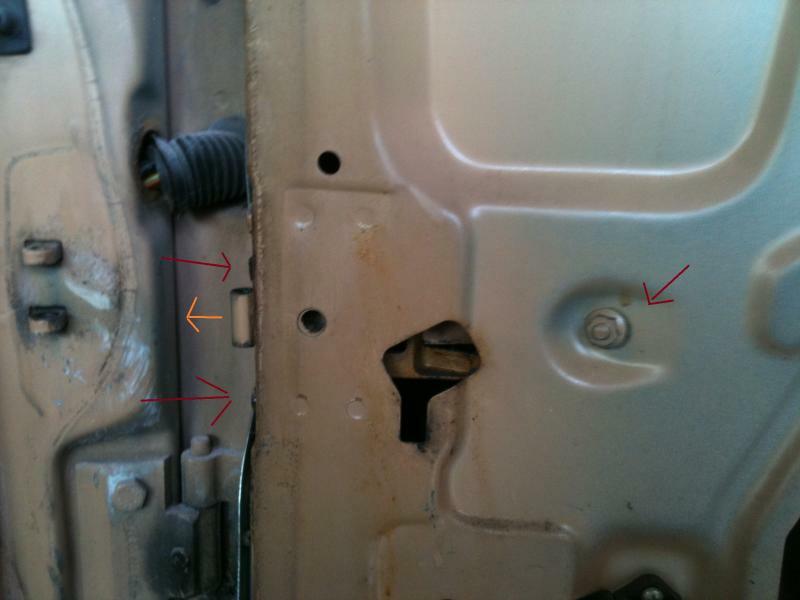 Read directions for pulling the door panel so you don't break the plastic tabs and embark on a search for door cards.. I've disconnected the door check by driving the pin out and allowing it to retract into the door; same behavior. I too thought this could be responsible for the resistance and was a little surprised to see no change. No pictures of the chunk of grass or lawn? when you took the strap off, did it push all the way into the door? the strap is supposed to stop the door before the hinges do. i bet it stretched. i am trying to upload a photo of how to remove the door straps. its pretty simple though, with the door panel off, remove the 10mm bolts that have the red arrow, and pull the strap right out. you may even be able to straighten it yourself. let me know if you cant. theres a nice 123 at the pnp by me here. make sure the hinges didnt get a small hairline crack, or even move a little bit. i dont know how fast you were going, but if the screws were a little loose, the force coulda pulled the door out of alignment. if it seems straight with the body, check the bottom hinge. Thanks everybody! You'd got me looking and focused on the right parts. The Door Check stretched as well as it's assembly shifted, causing it's mounting point (2 bolts) to bulge. That bulge is crushing the pin cover/boot and is crashing into the pin's bosses. The hinges are without cracks and remained in place. 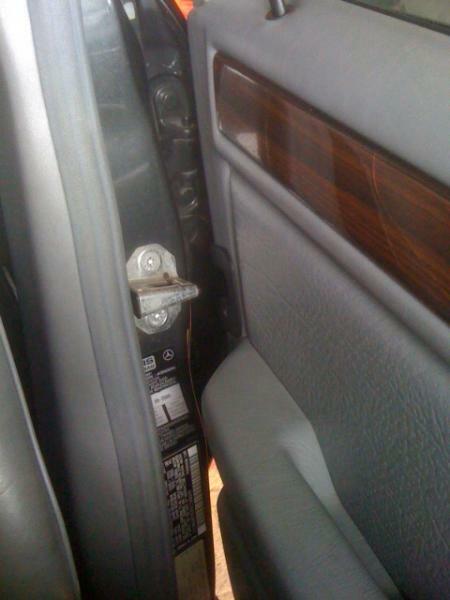 I will replace the door check assembly and hopefully eliminate the bulge with a piece of wood and dead blow hammer.